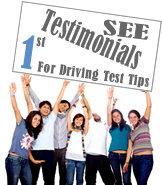 Tip: When you are on your driving test you should only do one thing/task at any one time. Example would be if your driver tester asks you to "move off and drive on straight", the first thing/task is moving off and then you drive on straight. Below you can see tutorials on how tasks are completed. In this Tutorial you will see how to Drive Straight. Remember you should concentrate on Driving Straight as this is all you are doing. In this Tutorial you will see how to Turn Left into junction. Remember you should concentrate on Turning Left as this is all you are doing. In this Tutorial you will see how to Turn Left out of junction. Remember you should concentrate on Turning Left as this is all you are doing. In this Tutorial you will see how to Turn Right into junction. Remember you should concentrate on Turning Right as this is all you are doing. In this Tutorial you will see how to Turn Right out of junction. Remember you should concentrate on Turning Right as this is all you are doing. In this Tutorial you will see how to Pull in and Stop on the left. Remember you should concentrate on pulling and Stopping on the left, you hand brake and neutral after the car is stopped. In this Tutorial you will see how to do the Turnabout. Remember you should concentrate on the turnabout and use good observation as this is all you are doing. In this Tutorial you will see how to do the Hand-signals. Remember you should concentrate on now to give the hand-signals and check your mirrors before you give hand-signals as this is all you are doing. In this Tutorial you will see how to Reverse around a left-hand corner. Remember you should concentrate on reversing, use all-round observation and travel at no more than walking pace. In this Tutorial you will see how to do the Hillstart. Remember you should concentrate on the hillstart as this is all you are doing. In this Tutorial you will see how to do the Brake and Indicator Checks. Remember you should concentrate on what your Driver Tester is asking you to do. Also let your window down so you can hear him/her. In this Tutorial you will see how to do the Under Bonnet Checks. Remember you should know these as there is a 90% chance you will be asked some of them. In this Tutorial you will see how to do the Tyre Checks. Remember you should know the Tyre Check as there is a 90% chance you will be asked. In this Tutorial you will see how to do the Secondary Control Checks. Remember you should know the secondary control checks as there is a 90% chance you will be asked. In this Tutorial you will see how to Steer. Remember this takes practice and you cannot position you car properly if you cannot steer properly. In this Tutorial you will see how you can Steer and Change Gear while turning. Remember this takes practice and you can change gear while turning if done properly. In this Tutorial you will see how to use your Brake and Clutch. Remember this takes practice and must be done properly. In this Tutorial you will see how to use your Mirrors in Traffic. Remember to check you mirrors only when it is safe to do so. In this Tutorial you will see how to use your Mirrors on the Straight. Remember to check you mirrors only when it is safe to do so. In this Tutorial you will see how to use your Mirrors Turning. Remember to check you mirrors only when it is safe to do so. In this Tutorial you will see how to Position your Car on the Road. Remember to have your Instructor advise you on local situations. In this Tutorial you will see how to simply deal with Progress and Reaction Hazards. Remember to have your Instructor advise you on local situations. In this Tutorial you will see how to deal with Speed Ramps. Remember to to have your Instructor advise you on local situations. In this Tutorial you will see what to do when you Stop at Traffic Lightsuse your Mirrors Turning. Remember to anticipate a green light changing to amber. In this Tutorial you will see how to use Roundabouts 1st Exit. Remember to have your Instructor advise you on local situations. In this Tutorial you will see how to use Roundabouts 2nd Exit. Remember to have your Instructor advise you on local situations. In this Tutorial you will see how to use Roundabouts 3rd Exit. Remember to have your Instructor advise you on local situations.